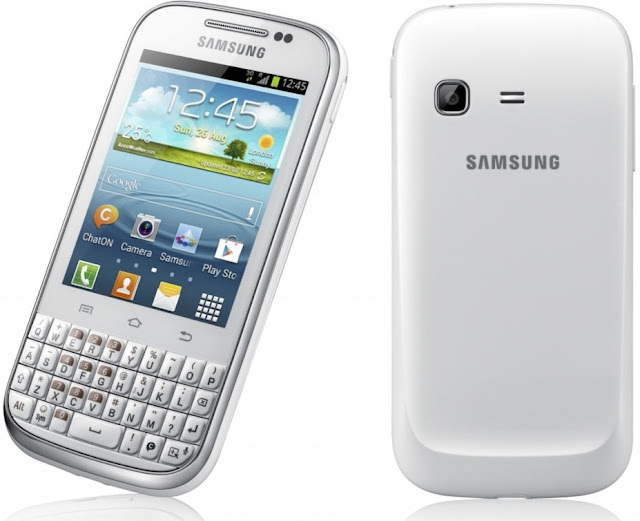 Samsung Galaxy Chat B5330 features a QWERTY smartphone with 3-inch LCD QVGA TFT capacitive touchscreen display having 240 x 320 pixel resolutions and is powered by 850 MHz processor, runs on Android 4.0 Ice Cream Sandwich OS with TouchWiz UX UI. The Samsung Galaxy Chat sports 2MP rear camera and VGA front-facing camera. It comes with 4GB of storage expandable up to 32GB using microSD card. Connectivity options of Galaxy Chat includes Wi-Fi 802.11 b/g/n, Wi-Fi hotspot, Bluetooth 3.0 with A2DP, microUSB 2.0 support, GPS with A-GPS support and GLONASS. Sensor options includes Accelerometer, proximity & compass. The Chat B5330 has a standard Li-Ion 1200 mAh battery. It weighs 112 gms and has a dimension of 118 x 59 x 117 mm. It comes with Quick Office and S Planner app. Tags:Samsung Galaxy Chat B5330, Samsung Galaxy Chat B5330 features, Samsung Galaxy Chat B5330 specifications, Samsung Galaxy Chat B5330 review, Samsung Galaxy Chat B5330 details, Samsung Galaxy Chat B5330 availability, Samsung Galaxy Chat B5330 specs, Samsung Galaxy Chat B5330 images, Samsung Galaxy Chat B5330 pics, Samsung Galaxy Chat B5330 pictures, Samsung Galaxy Chat B5330 price.